Bradley Cooper's new movie “Burnt” premieres here in Qatar on October 27th and Zomato is giving you a chance to win exclusive tickets to the red carpet premiere happening at NOVO Cinemas in The Pearl! I’m sure you’ve all heard of Zomato. Well, if you haven’t, it’s not too late to check it out and create an account of your own so you can share your amazing dining experiences and photos of food and restaurants all over Qatar. 1. Post your foodography on Zomato and share it on Twitter. 2. 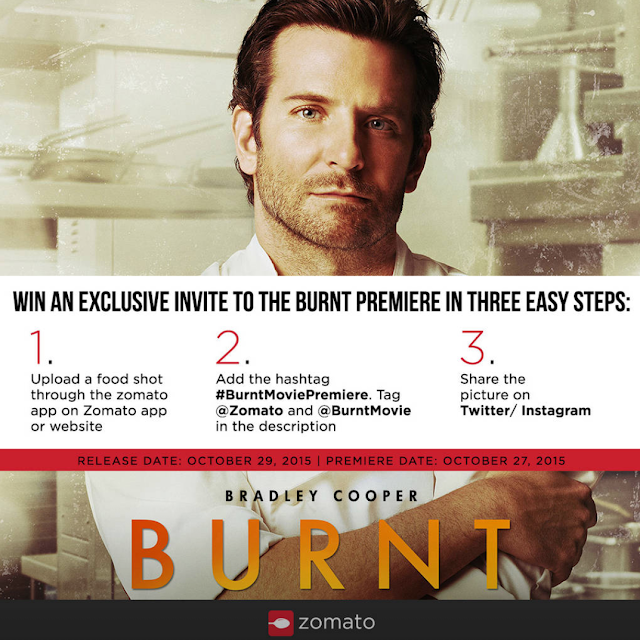 Add the hashtags #BurntMoviePremiere and #ZomatoQatar to your post. 3. Be sure to tag @BurntTheMovie, @Zomato and ME(@louannsab)! 4. And tag whom you'd take if you win a pair of tickets! 3. Be sure to tag @BurntTheMovie, @Zomato and ME (@louannsab)! Make sure you are following me on Zomato, Twitter and Instagram @louannsab and like my Facebook Page Live, Love and Lou. Winners will be announced on October 25th in time for the premiere on October 27th! Good luck and see you on the red carpet! Competition is for Qatar residents only. I enjoyed this film very much. Bradley Cooper is amazing in it and so is Sienna Miller.